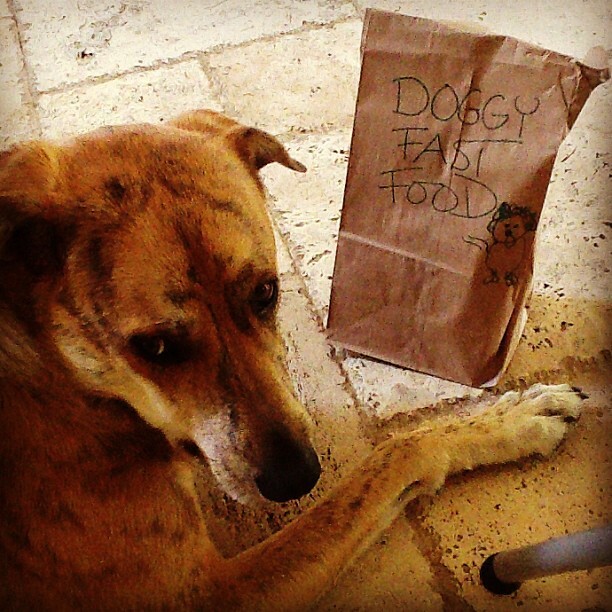 Are You Feeding Your Dog Fast Food? It’s no secret that I love to cook. I cook for my friends, my family, myself and my dogs. Yes, my dogs. I love them as much, if not more, than some people I must say. And their happiness, nutrition, and overall well-being depends on me, their caregiver. When I started on a road to healthier eating for me and my husband, that is when I started really researching what I was feeding my dogs. I was a person that was shopping for organic and healthy food for us, but then would head over to the dog food aisle in a grocery store and pick off the shelves what “looked” good. Hmm…did it have pictures of vegetables or healthy dogs on the bag? Ok, then, that was good enough for me. I was busy, blah, blah. Plus, if they were telling me the food was good, it must be good, right? Wrong. Sure, there are still people that will laugh at the notion that dogs can eat “table food”. But what IS table food? Real food? Why can’t dogs eat that? Why do we think we must feed them the equivalent to people “fast food”? Sure, its convenient. And yes, I will admit there ARE good quality dog foods out there besides the ones found on supermarket shelves. But what is making our dogs HAPPY? If there was a food you could eat every day for the rest of your life to supply all your nutritional needs, would you be HAPPY? I doubt it. I know I would be very UNHAPPY. So I ask you. Are you feeding your dog fast food? No, you may not go to a drive-thru, but that supermarket shelf might as well be the dog food drive-thru. Start researching your dog food. Find how how easy and simple it is to make your own. Whether that is raw, cooked, or a specialty diet, do you think that your dog is worth a few extra minutes for his well-being and happiness? I know you do. Place all ingredients in a food processor and blend or roughly chop to your dog’s preference. Store in freezer in individual serving sizes and thaw when ready!